There’s nothing better on the days leading up to Christmas than to cozy up on the couch with a cup of hot cocoa and watch a good Christmas movie. While the classic Christmas movies are always fun to watch, it’s nice to add a few new ones to the mix. It can sometimes be hard to find a wholesome, kid-friendly movie to watch, but Pure Flix has you covered with movies that are perfect for the whole family (and they offer a free month trial to test it out)! Perfect for the dog lovers in the family, A Dog for Christmas is about a girl named Kassandra who is wishing for a puppy for her Christmas gift. Her parents don’t feel the same, but Kassandra is hoping that Santa will come through! This movie is a wonderful option to watch as a family. A Christmas Eve Miracle is the story of Sharon and Dustin Holden who bring their family to a resort for Christmas in an attempt to become closer. A movie that is a good choice for all ages is Christmas Angel. There are great moral and Christian values taught throughout the movie. The movie tells the story of a girl named Olivia whose Christmas wish is for her mom to find a new husband, and a dad for her! This movie is another one for the dog-obsessed, and is also a great choice for the hopeless romantics in your household! Christmas Tail is about two single parents who are fighting over the custody of the dog that they want to give to their kids for Christmas. A great option for the whole family is a Christmas Snow. A woman who is stuck inside her home during a blizzard learns the true meaning of Christmas from an old gentleman and a youngster. Silver Bells is a great way to remind the family of what Christmas is really about, and to get away from the materialistic view of the holiday. Pure Flix has free Christmas movies available every Sunday until Christmas Eve, and Christmas Eve’s movie is Silver Bells! Wish for Christmas is a great story about a highschool girl who successfully wishes her parents’ faith away after they tell her she has to go to the church Christmas Eve service and miss the town’s winter dance. Christmas Grace is another faith-focused movie, with a story focused around a toy store owner who struggles with a competitor who is trying to put him out of business. Eight strangers are brought together during Christmas Miracle when there is a road closure due to a snowstorm and they’re forced to stay in an abandoned church. They learn a lot from each other during their time together, and are able to work together. Christmas Tree Miracle is movie that teaches the value of the gifts we share all year long. This movie is a great example of faith to share with your kids during the Christmas season! 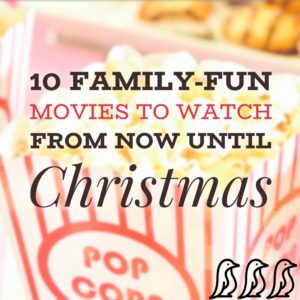 Grab a blanket, get the whole family together, and watch some Christmas movies! We’re only days away from Christmas, and one of these festive films is sure to get you in the spirit! And if you’re looking for a last minute gift to give to your grandchildren, a niece or nephew, or a family-friend, a subscription to Pure Flix is the perfect fit! You never have to worry about what the kids are watching when watching Pure Flix. Not to mention, they have a huge selection of educational movies and shows to supplement homeschool curriculum! You can give a Pure Flix gift membership of 3, 6, or 12 months! Happy Holidays everyone! Leah Hastings is the Outreach Coordinator at Pure Flix. Her faith is an important aspect of her life, and her favorite holiday is Christmas! Leah loves going on walks with her dog, and she loves a good caramel latte.